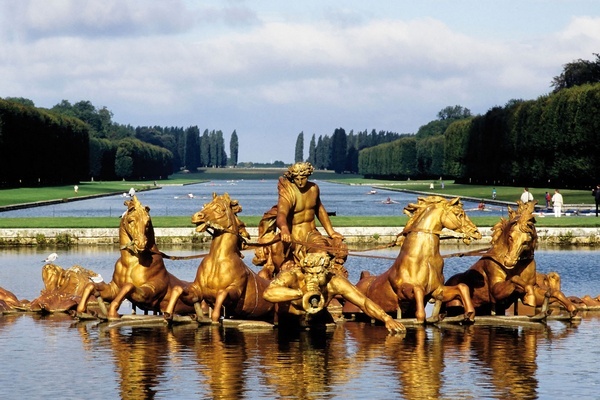 The fountain's impressive Apollo-feature was made between 1669 and 1671 but the spot itself already boasted a body of water during the reign of Louis XIII. The original pond was dug out in 1639 and called the "Pond of the Swans". The design of Louis XIV's addition was perfect both symbolically and aesthetically. Apollo - the Sun God - was designed by Le Brun and executed by Tuby. Originally, when the piece was transported to Versailles in 1670 it was still fresh from the mint and received its gilding the following year. The motif is as allegorical as could be wished for. 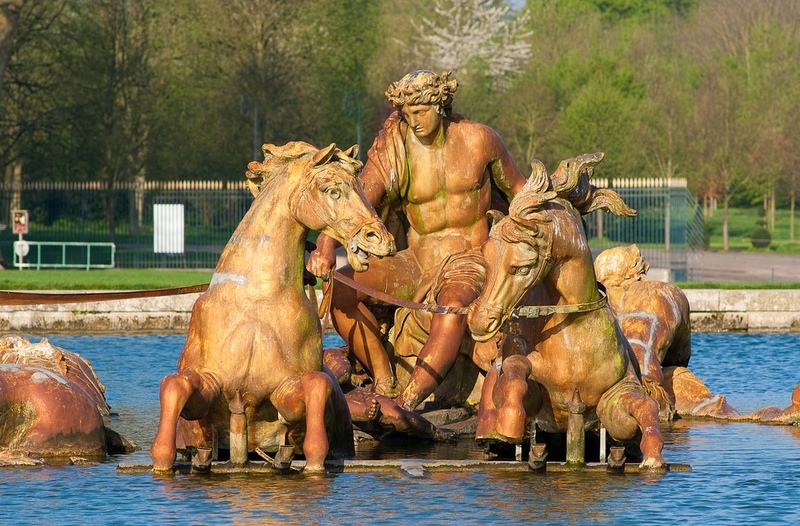 Apollo rises from the water in his chariot drawn by four horses to usher in the new day while cherubs herald his arrival. The pool in itself is quite large measuring 110 meters at it its widest. It formed the centre-piece of the post-banquet of the wedding of Louis XVI and Marie Antoinette. Once the guests descended upon the garden an impressive display of fireworks went of which focused on the Apollo Fountain. Immediately behind the Apollo Fountain the Grand Canal stretches on and on seemingly endlessly.